Today I found out what nougat is made of. There are three main types of nougat: white nougat; brown nougat; and German nougat. White nougat is made primarily from whipping egg whites, sugar, nuts (usually almonds, pistachios, or hazelnuts), and honey together. Brown nougat is made in a very similar fashion as white nougat, except generally without the egg whites and brown nougat usually uses caramelized sugar, making it a lot thicker than white nougat. Finally, German nougat, also known as “Viennese Nougat”, is generally made with only sugar, chocolate, and almonds. The nougat in candy bars typically is not made with sugar, but rather uses sucrose and corn syrup, then aerated hydrolyzed soya protein or gelatin, instead of egg whites. 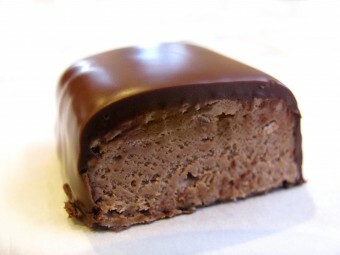 The word “nougat” is French and comes from the Old Provencal word “nogat”, meaning “nut cake”. This, in turn, derives from the Latin “nux”, meaning “nut”. Nougat is known to have been around since around the 9th century in Greece. However, it was a generally unpopular sweet until the 17th century in France. In many parts of Europe, nougat is a popular Christmas confectionery and is typically only popularly sold commercially around the holiday season. In Spain, the most popular form of nougat is called turrón. It typically comes in hard and soft varieties and usually is sold in block form. The hard variety is made with whole almonds set in the mixture, with approximately 60% of the mixture being almonds. The soft variety is made from ground almonds so that the almonds make a paste that is mixed in with the honey, sugar, and egg whites to make a very creamy form of nougat. Popular candy items that include some form of nougat are: Snickers, 3 Musketeers, Mars bars, Reese’s Fast Break, Baby Ruth bars, and Reese’s Whipps. In Italian nougat, called torrone, it is common to add vanilla or citrus flavoring to the standard nougat mix. Well gee, as long as it’s sucrose, not sugar…. Great, this article made me hungry. Big Hunk is chewy honey sweetened nougat with whole roasted peanuts. And the look candy bar is also nougat covered in chocolate. I love nougat.